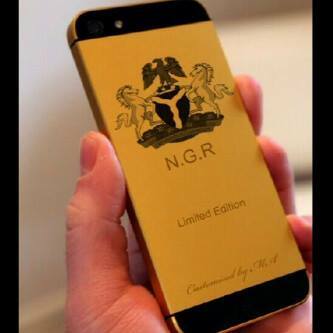 Didn’t Mr. President Say These Customised Gold-Plated I-Phones Are Non-Existent? Mr. President Goodluck Ebele Jonathan denied allegations that the Nigerian government ordered 53 customised gold-plated i-phones setting the country back by an outrageous sum, apparently to commiserate Nigeria’s 53rd wasted year of in-dependence. Where then did these specimen come from? Photoshop? Or just another pointer of the narcissism of our leaders.